Mudflat core sediments representing sub (V-1) and main (V-2) channels of the Vaghotan estuary were investigated for clay mineralogy and their chemistry. The depositional environment has regulated differential flocculation of clay minerals in sub and main channels of the estuary. 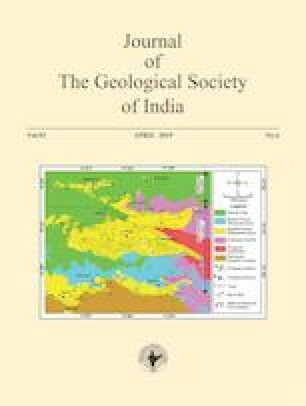 The concentration of kaolinite and smectite was higher than illite and chlorite in sediments which was attributed to the weathering of laterites and Deccan basalts in the drainage basin, and river-sea water mixing condition. Further, the concentration of Al, Fe, Mn, Co, Cu, Zn and Cr in the clay fraction was higher in the sub-channel than the main channel of the estuary. The variation in clay minerals composition, source of metals and depositional conditions regulated the distribution of metals in sub and main channels of the estuary. The significant correlation of smectite with Zn, and kaolinite with Al, Fe, Mn, Ni, Co and Cr in core V-2 suggests their role in sorption of metals. However, clay minerals (except smectite with Zn) showed insignificant correlation with metals in the core V-1. In the sub-channel adsorbents, other than the clay minerals seemed to have regulated the sorption of metals.